The Bolsey Model C and went on a special trek back in November with a roll of Fujifilm 400, 35mm. This particular camera belonged to an extended family member’s father who was a Korean War Veteran. Mr. Simms is buried at the Nevada Veteran’s Cemetery in Fernley, NV. At the time, Veteran’s Day was approaching so it seemed that this was a good way to pay our respects. And, reunite old friends for a moment. When I arrived back home that day, there was a rainbow across the backyard. I’d like to think heaven was smiling, especially since it came out on film. No small feat for me. The Yashica Mat EM and I went through two rolls of Kodak Portra 100, 120 film, when we visited Sacramento, CA, so hang in there while I add a little more fall color to the end of the year. Capital Park in Sacramento is full of all kinds of monuments and very special groves of trees dating back to the Civil War and the original pioneers to make it to the west. This fellow is Thomas Starr King (1824-1864) and he is credited with keeping California from seceding from the Union. All politics aside, he’s a sharp looking dude. Next up is this gent and a memorial for the Spanish War Veterans. He rises above a small pond that hosts trout and turtles year round. For Thanksgiving, my family went to visit some friends in Sacramento, CA, and our hotel was near the capitol park which was booming with fall color. It hadn’t occurred to me that the warmer climate would still be so full of leaves and color so I was happily surprised. And, I forced my family to detour through the park just so I could take a few snaps with the Yashica Mat EM. I’m more than happy with these shots on Kodak Portra 100, 120mm. Sacramento is designated as “The City of Trees” and there is obviously no question as to why. I converted this last shot to black and white in Lightroom because I like the contrast better. There are Christmas lights on this palm tree that are a little distracting in the color version. It seemed like a good idea to try out a new camera for a change. I have been having some good luck with old treasures until now so I’m not completely surprised that one of my cameras didn’t come out of storage and function as well as the others. This is the Kodak Stereo. It is designed for use with 35mm slide film so I put in a roll of Kodak Elite Chrome 100 and went on my merry way. 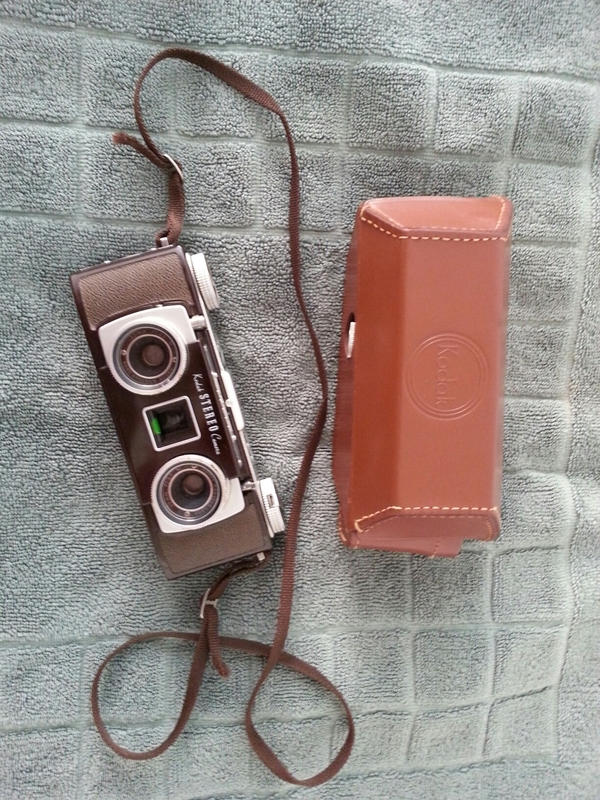 The camera and the leather case are in mint condition and beautiful. I’m a sucker for a good neighborhood park. And, it makes for an easy way to explore with my family, check out some fun little, hidden spots and, of course, burn through a good roll of film. I headed out with the Bolsey Model C and a roll of Fuji 400 35mm to revisit an old park that recently got a new facelift. This is Crystal Peak Park in Verdi, NV. The focus point was off here but I just thought the green grass looked so good. A rare treat here in dry Nevada. A new camera for the project: The Bolsey Model C. This is a nice little TLR that runs 35mm and is from the 1950s. The camera is a little special because an extended family member gave to me because he knows of my love for all things film. The camera was his father’s and it was his trusty memory-maker when he served with the Army in Korea. Anything that weathered through those conditions is an honor to hold. And, look … it takes pretty darn good photos, too! I wasn’t sure what to expect so I just used a roll of Fuji 400 at the neighborhood park just to see what would happen. This shot is facing the opposite direction from the baseball field. We were having terrible smoke conditions from a recent wildfire. Cough, cough. Sometimes, there’s nothing special going on and just ordinary things to photography. My son gets the mail at our house every day. This is one of his “jobs.” We check the mail every day after I get off of work and pick him up from school. Nothing good today in the box. Just junk mail. This school was built over 50 years ago. They take good care of it but that tells you how limited the funding for education here in Nevada is. Very. I won’t start a political rant here but they could make some serious changes, in my opinion. For real. There has been a song playing on the radio lately called “Drive-In Movies” by Ray Lamontange that is continually stuck in my head. And, it is making me want to visit the drive-in here in town. I haven’t been there in decades but I would like to go again. My husband differs in opinion. The theater is in a less-than-desirable part of town and doesn’t exactly attract friendly crowds sooooo … it might be a while before I talk him into this. In the meantime, I drove by there while running a work errand and snapped a few photos. It has been updated to HD but I’m not really sure how it works. Do you just listen through your car stereo now? Anyone out there want to go with me?